The Hedgewitchery Mentorship program is open for 2018 enrolment! This Mentorship program is for anyone who is connecting with themselves as a Spirit, anyone who is searching for something more than meets the eye in this vast & glorious world. You will be taken on a journey through a turn of one Wheel of the Year, a journey that will connect you to your Spirit, your path & your environment in a deep & profound way. It will equip you to maintain your own spiritual practice & inspire you to delve deeper into your own magickal gifts & sacred skills. Your mentor will be The Lady Le Faye, founder of The Hedgewitchery. Known to friends & family as Alison, the Lady Le Faye has very strong connections to her ancestry. She is the Granddaughter of the now deceased Tribal Elder of the Karawara Islands, East New Britain Province PNG, & is the descendant of a long line of farming folk originating from Wales & England. She was raised to respect the laws of the land, the spirit of the Creator & the importance of holding ceremonial space. Alison began her training as a Hedgewitch 26 years ago at the age of 16 & was under the guidance of her Shamanic mentor for 5 years. In her role at The Hedgewitchery, she provides community based rituals & festival gatherings, online readings using tarot & runes, personal sessions for ritual, Shamanic Reiki & readings, this mentorship program & a variety of other spiritual teaching programs. Alison has had formal training in Reiki, Aromatherapy, Western Medical Herbalism, and Homeopathic First Aid & has a current First Aid Certificate. She is also a qualified Nutritionist. During the course of this Year & A Day (one full turn of the Wheel of the Year) you will be connected with your broadest self, your various guides, guards & guardians, your personal internal world, your own ancestral ritual & magick, your innate magickal gifts & talents, & your sacred skills. Beginning at April 30, you will be invited to attend any available Dark Moon & Full Moon circles, Wheel of the Year Festivals, a minimum of 2 face to face or skype sessions with The Lady Le Faye (at a time that suits you both) every month, & you will be provided with workbooks to support your journey, as well as being connected to an online community of current & past students of this program. Although this program is based in Melbourne Australia, long distance options are available. Upon completion of your Year & A Day journey, you will be initiated into Hedgewitchcraft & ready to step out on your own & explore the magickal world that surrounds you. The cost is $150 per month for 12 months (payable on the 1st of every month), or $1500 as a lump sum prior to the beginning of the course. Payment plans are available. If you are interested or have any questions, please feel free to call or email me. There is a limited number of places for each intake so please register your interest as soon as possible. The Hedgewitchery Mentorship program is open for enrolment! This Mentorship program is for anyone who is connecting with themselves as a Spirit, anyone who is searching for something more than meets the eye in this vast & glorious world. You will be taken on a journey through the turn of one Wheel of the Year, a journey that will connect you to your Spirit, your path & your environment in a deep & profound way. It will equip you to maintain your own spiritual practice & inspire you to delve deeper into your own magickal gifts & sacred skills. Your mentor will be The Lady Le Faye, founder of The Hedgewitchery. Known to friends & family as Alison, the Lady Le Faye has very strong connections to her ancestry. She is the Granddaughter of the now deceased Tribal Elder of the Karawara Islands, East New Britain Province PNG, & is the descendant of a long line of farming folk originating from Wales & England. She was raised to respect the laws of the land, the spirit of the Creator & the importance of holding ceremonial space. Alison began her training as a Hedgewitch 25 years ago at the age of 16 & was under the guidance of her Shamanic mentor for the past 5 years. In her role at The Hedgewitchery, she provides community based rituals, this mentorship program & various spiritual teachings. Alison has had formal training in Reiki, Aromatherapy, Western Medical Herbalism, and Homeopathic First Aid & has a current First Aid Certificate. She is also a qualified Nutritionist. 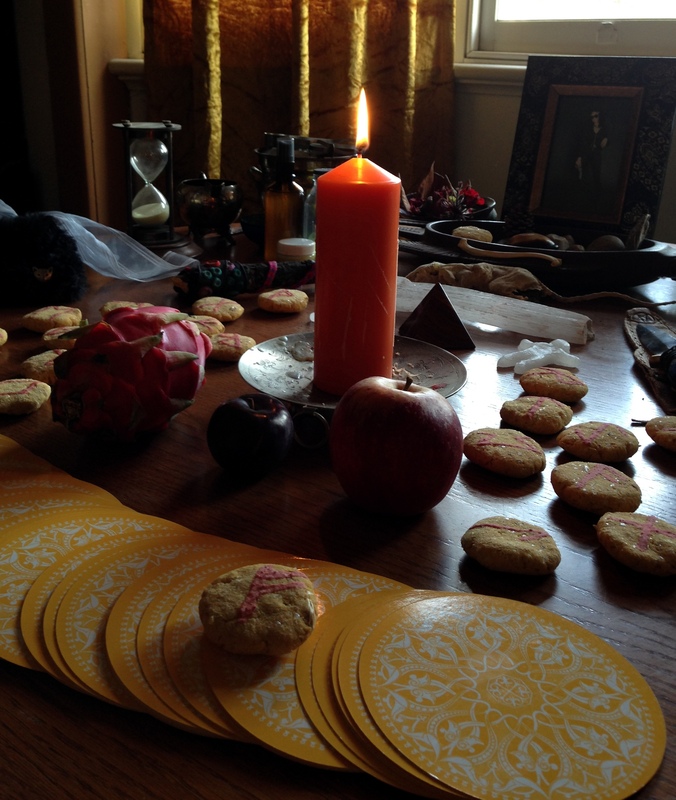 Beginning at April 30, you will be invited to attend Dark Moon & Full Moon circles, any Wheel of the Year Festivals & a minimum of 2 face to face or skype sessions with The Lady Le Faye (at a time that suits you both) every month. Upon completion of your Year & A Day journey, you will be initiated into Hedgewitchcraft & ready to step out on your own & explore the magickal world that surrounds you. The cost is $150 per month, payment plans can be arranged. Today, through the Balsamic phase, I have been preparing for this ending/beginning by cleansing & clearing. The intention for my workings this evening when the Moon turns New is to release unwanted habits, boost my resources & commit to a clear & solid path. Once this is done & to encourage the realignment of my mind/body connection & support the settling in of my new path, I will spend the next few days conducting my physical actions in the opposite way. For example, brushing my teeth with the other hand, walking a different way to the shop, eating my breakfast for dinner & my dinner for breakfast, etc. After a few days of this, perhaps when the Moon is waxing in Taurus, I will give myself another pathway reading & then, using quill & parchment, I will write a “To Do” list. This moontide is inspiring me to create a Follow My Bliss potion so this will be the central aspect of my Full Moon Rite. Thanks to Michelle Duke once again for you herb & essential oil contributions. I will perform this rite as the Moon rises full in Sagittarius on Friday the 13th of June (AEST). In preparation for this rite, I will be soaking in a bath with the following salt mix- half a cup of red rock salts, 1 tablespoon of epsom salts, 6 drops of Jasmine essential oil, 3 drops of Bergamot essential oil & 3 drops of Ylang-ylang essential oil. Gather all of the items along with some matches into the center of your space. Create your sacred space in the way that you are most comfortable with. Light the red candle & the incense. Sit holding the dark stones in your dominant hand & the light ones in the other. Let your mind clear of any external flirts & relax your physical self into your sitting position. Breath deep & slow… Allow yourself to dream up your most blissful moment, hold that feeling & send it into the stones that you are holding. 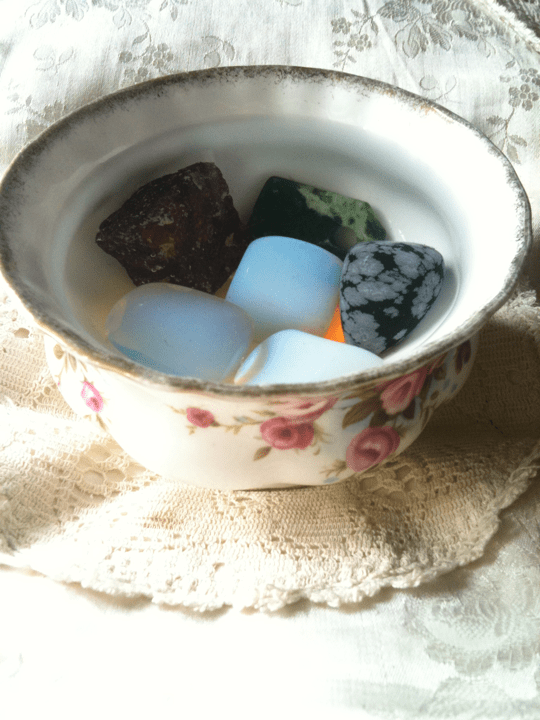 Place the stones into the center & take the bowl of herbs, cradling them in your hands & resting them in your lap. Then, let your mind be empty & discover what is hidden there in the water, your active role to play in the fulfillment of your bliss. Give thanks & open your space in the way that you feel most comfortable with. Allow the candle to burn out on its own. Take the bowl of water with the herbs in it outside to sit under the moon for the night & circle it with the stones. In the morning, strain the water into a bottle… This is your Follow My Bliss potion. Store this bottle in the circle of stones. Collect together the strained herbs, the candle stub & the incense dust & bury them or burn them within 7 days of your rite. This was passed to me via http://bookofeucalypt.wordpress.com/ & I am supporting the writing of the Word Smiths from our Magickal community by passing it along. The words & art that follow are not mine except for the answers the 7 questions & the 5 nominated blogs (please scoll to the bottom for links to these wonderful writers). How did you “discover” Wicca/witchcraft? I feel like I always new… Can’t really pinpoint a discovery moment. It became formalised for me at 16 when I bought my first deck of Tarot cards (The Herbal Tarot – http://www.aeclectic.net/tarot/cards/herbal/). Yes, several! And I use them in so many ways. No, I am clearly a wytch, all who enter my space are able to see it. As this has been my path since I was a teenager everyone knows but not all of them want to know so unless they ask I do not elaborate. This is because usually when I tell people there is a moment of pause followed either by many questions or an uncomfortable change of subject. I am a Shamanic Wytch & draw my training from every spiritual teacher that will share with me. I have a very deep connection to Ancestral Magick. As I said above, I am a Shamanic Wytch. Every breath, every word, every sensation, every movement, eveything I do every day is steeped in Magick. I have a cat named Juniper who was gifted to me by another witch. She is my third cat familiar in this life time. She is drawn to any magick work that I do & is often quite giving of her energy during the process. Today is a very special day. Not only is it Samhain, the most important Sabbat on the Wiccan Wheel of the year, but it is also the unveiling of a project Cassandra and I have been working on for a couple of months. Over the past weeks, we have both been graced with several blogging awards, but we couldn’t help but notice that none of the awards floating around were Wiccan in nature. And so, the idea was born to create an award specifically for Wiccans/Pagans/witches. Thus the purpose of this award is to bring positive recognition to those bloggers who share their experiences on the less-traveled path, whether in the form of a journal or by standing up for themselves and others. Our award logo was a collaborate endeavor made with love that we are both very proud of. So without any further ado, onward to the details of the newest award to find its way to the blogsphere!